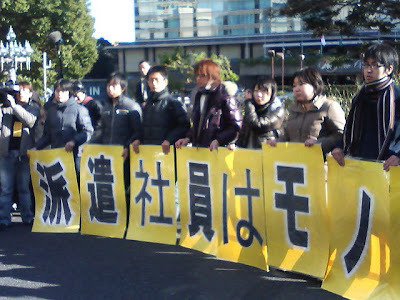 Eight trade unions, leading ex-dispatched workers who were dismissed before their contracts would terminate, tried to present an “open letter” to Mitarai Fujio, president of Kendanren (Japan Federation of Economic Organizations) in the afternoon of January 6, 2009. 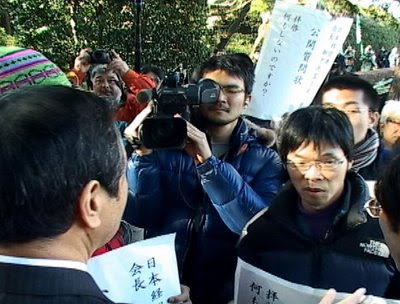 The question was, “Why are you silent despite an increase in social instability as a result of the harsh dismissal of temporary and dispatched workers by Keidanren member companies, such as Canon and Toyota, while people and local governments are working hard to tackle the problem?” The demonstrators visited Hotel New Otani, where the federation’s new-year party was held. The lobby of the hotel was filled with more than a hundred persons including news reporters, making the hotel upset. The confusion continued as Keidanren refused to receive the letter, but it was finally settled down when the hotel decided to keep it. Mr. Mitarai hopefully felt the anger of the dismissed closely. Labor Fiesta 2008: Satire, Humor and Rage.